A stay at Windermere Suites promises luxury and indulgence. So why not keep this up during your time in the Lake District? One of our favourite ultimately-indulgent places in Windermere has to be The Fizzy Tarte. Offering champagne, cocktails and afternoon tea like you’ve never experienced it before – The Fizzy Tarte is always popular amongst guests at our Lake District luxury hotel. Windermere has such a wonderful selection of bars, restaurants and cafes, and we love being able to recommend our favourites to our lovely guests. There’s always time for afternoon tea in the Lake District, and The Fizzy Tarte do an elegant and indulgent variety of afternoon tea options to satisfy your taste buds. With a choice of cream tea for two, classic afternoon tea for two or The Fizzy Tarte ultimate indulgence – you can pick whatever level of luxury you fancy. Our favourite, of course, has to be The Fizzy Tarte ultimate indulgence – you have to spoil yourself every now and then! With a variety of sweet treats, alongside mini sandwiches and a glass of rose or prosecco, you’ll truly be in heaven here. The Fizzy Tarte also do a great selection of cocktails, so it wouldn’t be unusual if your afternoon tea extended into the evening. We love the stylish décor of the place which just oozes luxury and indulgence. After spending a night in our Lake District luxury hotel, you’ll feel right at home! The Fizzy Tarte is the ultimate spot to visit for any afternoon tea lovers, so make sure to pay it a visit during your stay at our Lake District luxury hotel. We’re more than happy to recommend places to eat and drink during your stay with us – we love sharing our favourite spots with all of our guests, so don’t hesitate to ask! If you’re a fan of chocolate then look no further than the fabulous Choccobar. It has five-stars on TripAdvisor and hundreds of amazing reviews, so we went to see what all the fuss was about – now we understand! Choccobar is a relaxed little coffee shop, just a twenty-minute walk from the Suites, where chocolate lovers will be in absolute heaven! Their original hot chocolate is so luxuriously thick it even comes with fruit to dip in, a side of fresh whipped cream and a lady finger sponge to reach the bottom of the glass! Choose from a range of different chocolate flavours – from amaretto, to chilli, to coconut or even custard and cream. There are over 20 fantastic flavours to choose from! The waffles at Choccobar are out of this world. Take your pick from a selection of toppings on their light and fluffy homemade Belgian waffles. A personal favourite of mine is the banana and Cartmel sticky toffee sauce – it’s the ultimate form of indulgence! If you’re a fan of strawberries, then look no further – Choccobar have a variety of strawberry-topped waffles paired with a choice of cream, ice cream and Nutella. Choccobar is the chocolate lover’s ultimate fantasy, so make sure you pop in during your stay at our luxury hotel. Feel free to ask us for recommendations during your stay with us – one of the things we love about being a luxury hotel in the Lakes is the fantastic choice of places for our guests to eat and drink, and we love sharing these with you! One of the best things about Windermere is its fantastic selection of bars and restaurants. At Windermere Suites, we love discovering the best places to go to recommend to our lovely guests. We understand that with so much choice, it can be hard to decide where to go – so we work hard to ensure you can make the most of your time at our luxury hotel in the Lakes! We recently visited The Pig Windermere ­– what a treat! With a menu specialising in all things pork, we couldn’t resist paying it a visit. Their classic British menu focuses on fresh, local produce and pork in all its forms. We highly recommend the ‘Pig Feast’ pizza, and by looking at reviews on their TripAdvisor – it seems as though there are plenty of others who would agree with us! Think of a homemade pizza base topped with sucking pig, smoked ham, pigs in blankets, tomato base, mozzarella and fresh herbs. And yes, it does taste as good as it sounds! If you’re not a fan of pork, or you’re a vegetarian, don’t worry – there are plenty of other options available with a menu designed to suit all tastes. The Pig pride themselves on their selection of Gluten Free options too, so they really do have something for everyone. The warm goat’s cheese salad with oven roasted mixed beets, vine tomatoes, sautéed potatoes and chargrilled peppers looked to die for! To wash down your meal, The Pig also have a wonderful selection of drinks in their bar. Our favourite by far was the ‘Skinny Champagne’ – more bubbles, less calories. What more could you ask for?! Our luxury hotel is located less than a 5-minute walk from The Pig, so we’re in prime location to satisfy all your pork-loving needs, without having to worry about driving anywhere! Next time you stay with us, don’t forget to ask for a recommendation – we love being able to share all of our favourite places with you. Windermere Suites are known for being luxury suites in Windermere, and part of that level of luxury is our five-star approach to interior design. Whilst we aim to make your stay with us as comfortable and enjoyable as possible, we also aim to astound you with the attention to detail in each of our sumptuous suites. We are lucky to have our gorgeous early 20th century traditional stone and slate building to work with; it’s this Lakeland house that we have transformed into something truly luxurious. From the Perspex furniture and mirrors by Kartell to the snakeskin sofas and Tektura wall coverings – our interior design fulfils a lavish, contemporary look from floor to ceiling. We believe that all eight of our suites pack a real design punch – with luxury monochromatic colour schemes and stunning individual pieces from a range of designers such as Frank Hudson, as well as some stunning bespoke, handmade pieces. Everything has been designed to truly wow you, from the moment you walk through the doorway, to the moment you crawl into your huge bed – we’ve thought of it all. At our luxury suites in Windermere, each one is different, yet they have all been made to impress. With unique items in each, such as acrylic pictures and dressing tables by Frank Hudson, you can expect your stay at Windermere Suites to be truly beautiful. From the outside, our traditional stone and slate exterior may look unassuming, but step inside and it’s a completely different story! Our suites have been designed with romance in mind, so think huge baroque style beds, designer furniture and ambient mood lighting alongside double air baths made for sharing. We pride ourselves on our opulent interiors. Whichever suite you decide to stay in, we guarantee that you will fall in love with our contemporary luxe style. If you fancy experiencing five-star interior design in the heart of the Lake District, then Windermere Suites is most definitely for you. 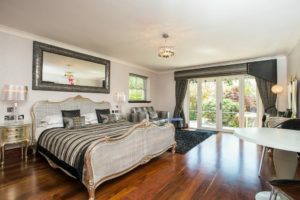 Not sure what a stay at a luxury suite in Windermere is really like? Why don’t you come and see for yourself? Book a stay in one of luxury suites and experience award-winning incredible interior design like none other!